United Airlines executives were so confident of the protection racket they enjoy in Chicago that they continued to break asbestos laws - right in plain view of Environmental Protection Agency (EPA) and Occupational Safety and Health Administration (OSHA) inspectors. This display of arrogance is so unbelievably brazen considering the fact that the EPA and OSHA put other people in prison for breaking these same asbestos laws. In March of 2015, the EPA and OSHA received multiple complaints that United was illegally removing and dumping asbestos from its former World Headquarters (WHQ) in suburban Chicago. So they begrudgingly opened a so-called " joint investigation". What followed is a blatant display of government corruption that is hard to fathom even for Chicago. For example: During the EPA's and OSHA's so-called "joint investigation" of illegal asbestos removal at United's former WHQ, government officials were given the exact time and location of crimes in progress at the very same facility they were supposedly investigating. A&E Services, Inc. is presently removing asbestos illegally by the dry removal method at United Airlines' campus located at 1200 E. Algonquin Rd. Elk Grove Village IL. The work that I am bringing to your attention this time, is being done in machine room 1 (boiler room) of the south building. A&E is scraping the friable spray-on asbestos fireproofing material off the ceiling deck. Again, no notice was given and regulations are not being followed. And once again, the asbestos that was removed from the ceiling is being transported to another location for undisclosed dumping. And as we discussed, the illegal dumping of asbestos is definitely with-in your purview. The attached pictures are of the area where this illegal abatement is happening. The work is being done in the evening. You said you need to catch them in the act. Well go do so. As required by whistleblower protection mandates I must insist that the attached pictures and the existence of them not be disclosed to United Airlines or anyone outside of the EPA until consent is given. 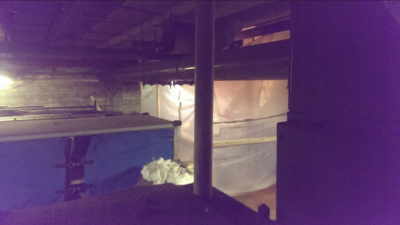 In the days to follow, United's asbestos contractor, A&E Services Inc., completed this particular illegal asbestos removal project and then moved on to another without even one visit from EPA or OSHA inspectors. Clearly the EPA and OSHA didn't really want to catch United in the act. Luckily someone else caught them in the act - on video. Oops! The bad guys didn't see that coming. And now corrupt government officials are trying their best to escape the fact that a video recording of this illegal asbestos removal project exists. They also did not anticipate me obtaining A&E Services' invoices for all the illegal asbestos removal work it was doing for United. 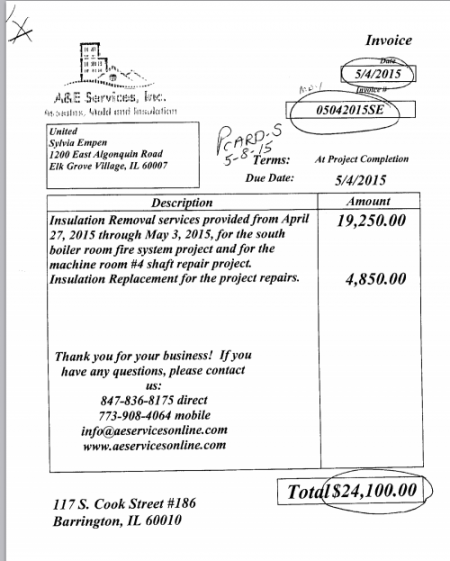 Over the course of ten months, A&E submitted 68 separate illegal asbestos abatement invoices and was paid immediately upon completion of each job. Under normal circumstances, where a company is not politically protected and the law is enforced, each and every one of those 68 separate illegal asbestos jobs would have garnered a minimum of at least one $70K "willful violation" citation from OSHA. That's a total of $4.7 million in fines just for starters. In addition, A&E Services owner Robert Nykaza - along with numerous United managers - would be singing like canaries to stay out of prison. 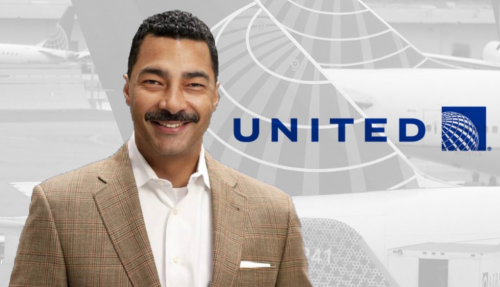 And most troubling of all for the big-shots at United, this would all lead to the opening of a very big can of worms involving financial records, corporate filings and false disclosure statements. That's when the fun would really begin! Of course, United executives could not afford to let that happen. Not when they could just buy political protection. Needless to say, this kind of corruption causes government officials to go completely deaf and blind to all things bad. And also explains why Nykaza has been threatening me and a United Airlines whistleblower because we are exposing them. I'll have more on Nykaza at a later date. Even in Chicago, only big well-connected corporations like United are afforded this level of political protection. Put simply, United Airlines enjoys above-the-law status for the moment. The Question is: With more proof of United's criminal behavior on the way, how long will that last?